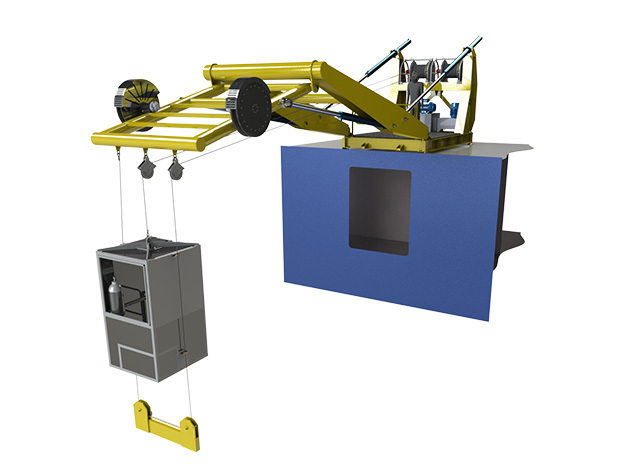 Unique Group’s Diving & Life Support division has developed a new launch and recovery system (LARS) for diving operations. The LRE50-A2 extended reach diver LARS was designed to resolve an operational requirement to deploy divers a distance off of the side of a vessel. Dynamically positioned (DP) diving vessels need to keep a safe distance from offshore oil and gas platforms or floating production, storage and offloading (FPSO) units. This distance offset from the dive site is a challenge to diving operators as divers’ excursion distance is limited by the length of umbilicals and the need to ensure divers are always a safe distance from a vessel’s thrusters. To overcome this operational challenge, diving contractors will typically make use of what is referred to as a ‘Gold Gate,’ which provides an aperture through which the divers will pass on route to the dive site. The Gold Gate is typically suspended from the vessel crane which limits the use of the crane during diving operations. Unique Group’s Hydra engineering team spent time engaging closely with clients to understand their operational requirements to provide an engineering solution to meet their specific requirements. The result, the LRE50-A2, is based on safe operational requirements and a design FMEA. The unit is also DNV-approved and designed in accordance with the latest guidelines from the International Marine Contractors Association, and the PUWER and LOLER requirements. The LRE50-A2’s compact design also ensures that minimal deck space is utilised with a skid footprint of only 4.2m by 2.83m. The unit is provided with a remote control station that operates the A-frame boom and knuckle, main winch, guide wire winch and umbilical power sheaves via joystick and button control.